SOLE Admin – Page 2 – Selkirk Outdoor Leadership & Education (SOLE), Inc.
SnowSchool Experience Program receives national attention! SOLE’s SnowSchool Experience SM Program is once again in full swing fostering numerous opportunities for youth throughout the Inland Northwest to experience the transformational place-based experiential education curriculum that this program has become known for! From after-school programs to custom-tailored outings for schools and youth groups, SOLE continues to strive to offer a SnowSchool Experience SM programs for all stakeholders throughout the Inland Northwest, and beyond! Because of this program over 60% of youth participants are able to explore and learn about their local winter wildlands for the first time via snowshoes. For the 2016 season SOLE will once again be working with Lake Pend Oreille School District (LPOSD) where every 5th grade student will receive a SnowSchool Experience SM thanks in part to a $10,000 Panhandle Alliance for Education (PAFE) grant. This will result to over (250) youth participants in this program alone for the 2016 season! But it doesn’t stop there. SOLE will working with other local area schools. This will include designing and facilitating custom-tailored SnowSchool Experiences SM for Clark Fork Middle and High School (see video below), Post Falls STEM classroom, and Selle Valley Carden School. SOLE will also be providing SnowSchool Experience SM programming for Lake Pend Oreille High School as part of a larger place-based experiential education program known as The Confluence Project. This will include a capstone project where students will present their semester’s work at the Idaho Youth Water Summit at the University of Idaho. Most SnowSchool Experience SM programs include a (3) day place-based experiential education design tailored to local watersheds and include snow science, winter ecology and outdoor living skills. While it certainly is a fun day beyond classroom walls, this curriculum also includes the opportunity for alignment to state and national math and science standards ensuring that educators, and those they serve, receive an intentional outdoor education experience from start to finish. We have some exciting new developments this year in our SnowSchool Experience SM program to include our new partnership with the Idaho Panhandle Avalanche Center (IPAC) and Gizmo – CDA. These new partnerships will allow us to reach and teach more local area youth in novel ways during the winter months at one of our (4) SnowSchool Experience SM site locations in Washington, Idaho or Montana! Specifically, our new partnership with Gizmo will allow us to offer a (4) day after-school SnowSchool Experience Programs at Lookout Pass. True to our other SnowSchool Experiences SM students will learn snow science, winter ecology, and outdoor living and travel skills. 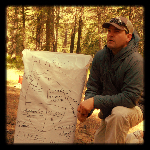 Course lessons will explore the relationship of mountain snowpack in our region to community natural resource needs through active and engaging fieldwork. Coupled with pre and post lessons in the classroom, including accessing and utilizing SNOTEL, students will develop skills that reach well beyond their SnowSchool Experience SM. Because of the after-school design this novel program is perfect for parents of home-school youth, and those in youth groups interested in exploring and learning in their winter wildlands via snowshoe. Learn more and register for this program here. In addition, we are grateful to have IPAC assisting us with extending our current SnowSchool Experience SM curriculum for middle and high school youth to include avalanche awareness in addition to our current established outdoor leadership, outdoor living and travel skills, snow science and winter ecology curriculum for these grade levels. Like all SnowSchool Experiences SM curriculum allow students to explore and learn in their local mountain ecosystems. We recently launched a new short video capturing the extension of this novel SOLE Experience SM and it received national attention! See the skinny here. Click on the video below to see what our middle and high school SnowSchool Experience SM Program is all about! We continue to be sincerely grateful for our program partners which include the Winter Wildlands Alliance, Schweitzer Mountain Resort, Lookout Pass and Recreation Area, Mt Spokane and those mentioned above. Learn more about our SnowSchool Experience SM Program by clicking here. What’s in store for winter? With an El Nino season shaping up there is really no way to tell. It could be epic like the fabled dumps of 1997 in the nearby Selkirk’s or lack luster. Either way, we know that there will be opportunity to explore the backcountry this winter. As such, SOLE will continue to offer and expand our winter programming options to meet the need to educate both youth and adults alike in outdoor settings. What does this mean? To begin with, last night leaders from SOLE and the Idaho Panhandle Avalanche Center (IPAC) came together for an evening to celebrate and flush out a new community partnership. As an experiential education non-profit which leads expeditions in the winter backcountry and skill development workshops for those looking to become more savvy, SOLE feels that partnering with IPAC is a phenomenal opportunity to collaborate to support our local avalanche education center while also assisting the continued expansion of our programs. This will include expanding the Avalanche Education Experience SM Program to include more youth-based and modality-specific avalanche awareness and AIARE Level 1 / 2 courses, as well as extending our current SnowSchool Experience SM Program. This will include a middle and high school, place-based education curriculum which focuses on studying the avalanche phenomena in our local environs. So, not only will SOLE continue to educate our community stakeholders including youth and adults through our pre-existing programs, we will be partnering with local avalanche forecasters to deepen those experiences and provide an opportunity for participants on how to get involved with a great local organization. This will also include understanding how to collect and enter snow science data in the field, so we can begin to develop a more consistent database for our local backcountry. To learn more about this partnership come on out to the Idaho Pour Authority in Sandpoint, Idaho for Ales to Put Youth on Trails Event on November 11th, 2015. You can learn more about this event by going here. You can also learn more about our SnowSchool Experience SM Program by clicking here , and our Avalanche Education Experience SM Program, including our upcoming AIARE avalanche education curses here.